Obviously, 707 hp wasn't enough for Hennessey Performance. The Hellcat-powered Jeep Grand Cherokee Trackhawk will be . This insane SUV has a 6.2-liter 707-hp supercharged V8 that can rocket the car up to 60 mph in just 3.5 seconds. Clearly, this insane performance of Hennessey Performance. The Texas-based tuning company has just for the Jeep Grand Cherokee Trackhawk. This package brings the horsepower up to a massive 1,012 hp at 6,500 rpm and 969 lb-ft torque at 4,200 rpm. With the Hennessey package, the Trackhawk can hit 60 mph in just 2.8 seconds. This puts it within spiting distance of a Tesla Model S. The Hennessey-tuned SUV then goes on to complete the quarter-mile in just 10.5 seconds at 133 mph. This insane power comes mainly from a 4.5-liter Supercharger system producing 14 psi boost. The kit also includes stainless steel long tube headers, a high-flow supercharger bypass valve, upgraded high-flow fuel injectors, a factory fuel pump upgrade, a high-flow air induction system and an HPE engine management upgrade with chassis dyno calibration. Buyers of this package will also receive a rear Hennessey badge and "HPE1000 Powered by Hennessey" badges on the rear and sides. The cars will also have a serial numbered plaque signed by John Hennessey on the interior and a signed plaque by the technician that builds the car in the engine bay. Like other Hennessey cars, the Trackhawk will come with a one-year, 12,000 mile warranty and be able to run on 93 octane gas. 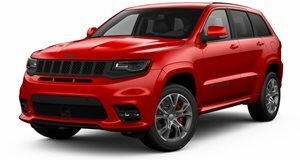 If the normal Trackhawk wasn't enough, this amazing machine should get people excited.